Starting from 4.0, Samsung Internet provides ability to write extensions to block contents on the web page. Content blocking extensions not only allows users to browse the web without unnecessary content cluttering their screen, but also provides ability to browse the web more safely and privately. Recently we announced all the new features that are coming with Samsung Internet 5.0. In Samsung Internet 5.0, we further improved privacy by introducing Duck Duck Go search engine to make your searches more private. Today we are very excited to announce, Disconnect’s extension for Samsung Internet. The extension provides free tracking protection for Samsung Internet browser and makes browsing experience faster, safer, and better. 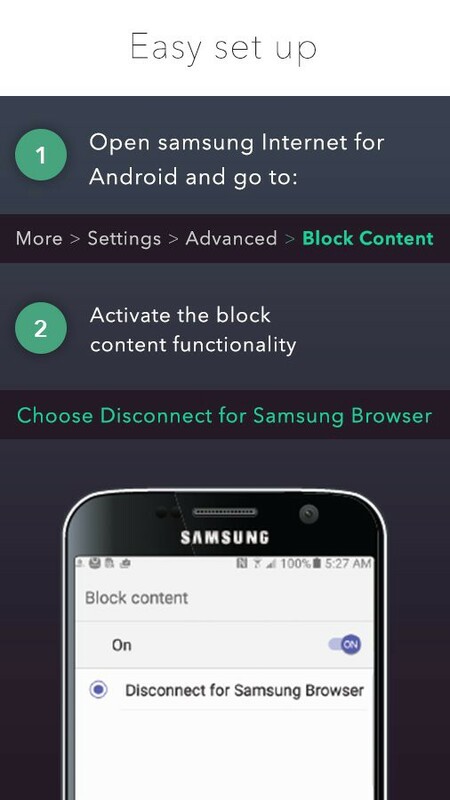 Disconnect blocks privacy invasive trackers inside the Samsung Internet browser to make your web browsing safer, accelerates page load speed by up to 44% and reduce cellular data waste by up to 39% depending on your device usage! To enable tracking protection for Samsung Internet, download Disconnect extension from playstore and enable “Disconnect for Samsung Browser” from More > Settings > Advanced > Block content. Disconnect also introduced “Disconnect Pro” android app which provides device wide tracking protection exclusively for Samsung devices. You can download Disconnect Pro from Galaxy App store on your Samsung device. Samsung is committed to give privacy options and controls in our increasingly connected online world and we are excited to have partnered with Disconnect.